After applying a pre cleaning agent to assist in removal of oil, food stains, ground-in dirt and efflorescence a deck solutions professional will clean your patio surface using a 3500 psi pressure washer with a whisper wash surface scrubbing machine. 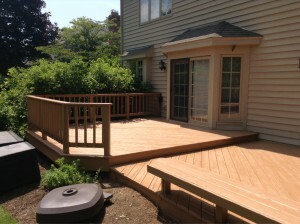 Deck solutions will always take care to rinse the entire work area and make sure to leave the entire area clean before the next step of your patio restoration. Once the pavers have had time to dry we will begin to replace the sand with polymeric joint stabilizing sand. After all the joints are thoroughly filled and the surface is brushed clean a light shower of water will harden the joints. After ensuring the pavers are completely dry Deck Solutions will apply a liberal coat of sealer using a combination of rollers and airless sprayers.